AquaTough Pond Liner with J-Tear Protection: 40 Foot Wide X Length Desired | William Tricker, Inc.
AquaTough Pond Liner with J-Tear Protection: 40 Foot Wide X Length Desired. The following can be selected are liner widths (40 feet) by the desired length. See below description for J-Tear Feature. Tricker's has been selling EPDM liners for decades, and now the J-Tear Protection will bring you peace of mind when cutting or if a tear occurs. You will want the best and the AquaTough brand offers such! 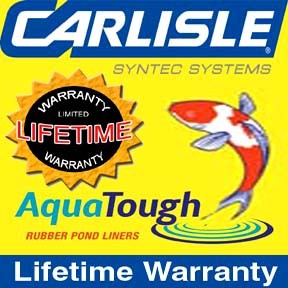 This liner has a limited LIFETIME Warranty, you know it must be the BEST! Longer lengths are available, please call for quotes. Note that all liners are NOT the same, this liner has a Limited LIFETIME Warranty! Purchase with confidence! What is J_Tear Protection? This means that when cut, unlike other competitor liners, the cut will not tear in a long line but, if tears, will tear in the direction of the cut for a short distance and then it will change direction and attempt to curve back on itself. A lot said, but it takes the worry out of the liner tearing around a water feature, etc. and leaking. CLICK HERE to see a video on the J-Protective Test.